Expired 1y ago . Last validated 1y ago . Used 87 times. 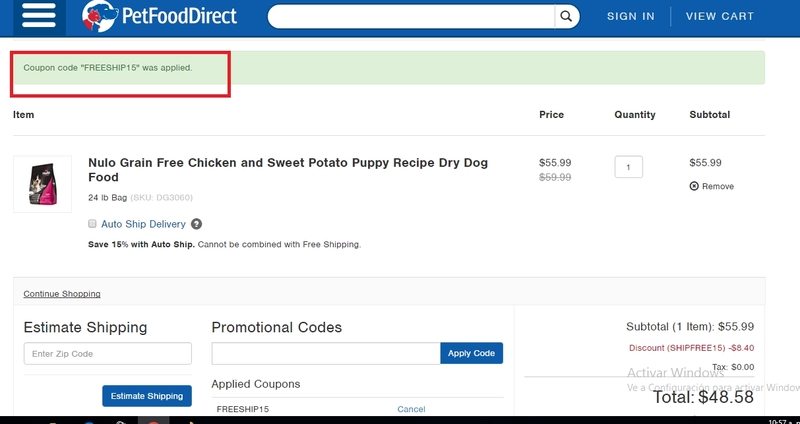 Eugenio Marquez Only put this code in your cart. Enjoy the discount. This offer cannot be combined with any other offers. Offer is not valid for any bulk purchases, clearance or sale items and is subject to availability. This is a limited time offer. Thanks for visit this deal. Anthony Castro *Offer ends at 11:59 pm ET, April 21, 2017. 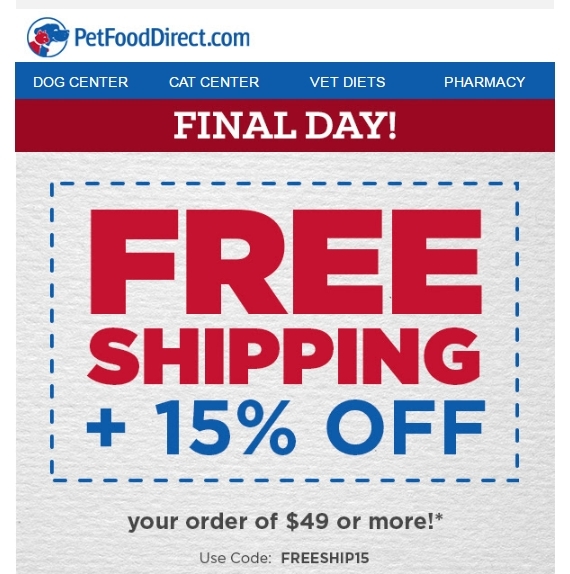 Free Shipping + 15% Off is valid on orders of $49 or more. Enter promo code FREESHIP15 at checkout to redeem. One time use per customer. Ground ship only, and the following products are also excluded from free shipping: frozen & refrigerated products, cat litter, small animal and bird bedding, small animal and bird food, Pestell Paw Thaw Ice Melter, Safe Paw Ice Melt and PlaySAFE Natural Organic Fertilizer. Free shipping cannot be combined with the Auto Ship 15% discount, or with any other promotions, or promo codes. In-stock items only; no rain checks. Not valid outside the continental United States. Not for use in combination with other coupons, or loyalty and reward websites. 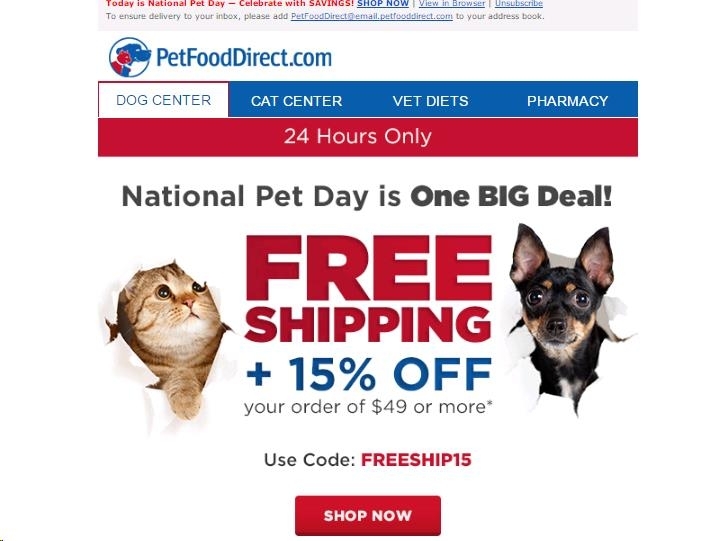 Jonathan J. Bello P. This code works perfectly as described, get Free Shipping + 15% Off Your Orders of $49 or More at PetFoodDirect, just copy and paste the code at checkout. Sophia Discount is not valid on prior purchases and cannot be combined with any other discounts. Other exceptions may apply. Anthony Castro *Offer ends at 11:59 pm ET, April 12, 2017. 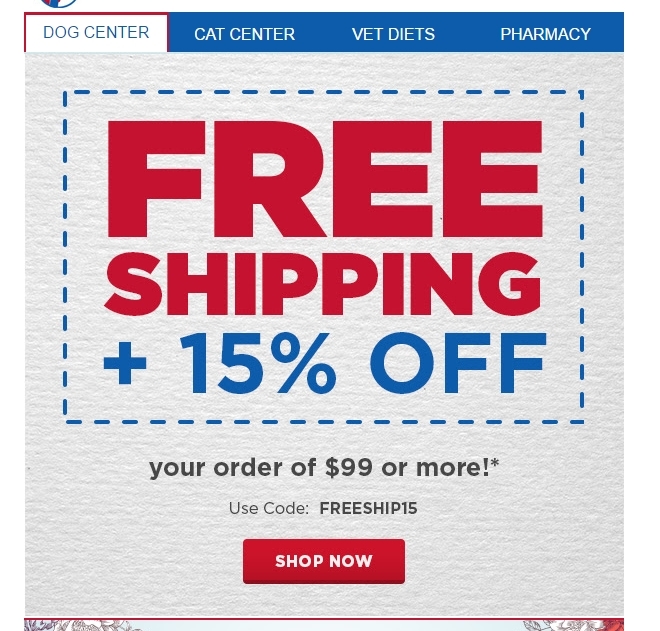 Free Shipping + 15% Off is valid on orders of $49 or more. Enter promo code FREESHIP15 at checkout to redeem. One time use per customer. Ground ship only, and the following products are also excluded from free shipping: frozen & refrigerated products, cat litter, small animal and bird bedding, small animal and bird food, Pestell Paw Thaw Ice Melter, Safe Paw Ice Melt and PlaySAFE Natural Organic Fertilizer. Free shipping cannot be combined with the Auto Ship 15% discount, or with any other promotions, or promo codes. In-stock items only; no rain checks. Not valid outside the continental United States. Not for use in combination with other coupons, or loyalty and reward websites. You can also place your order by telephone! 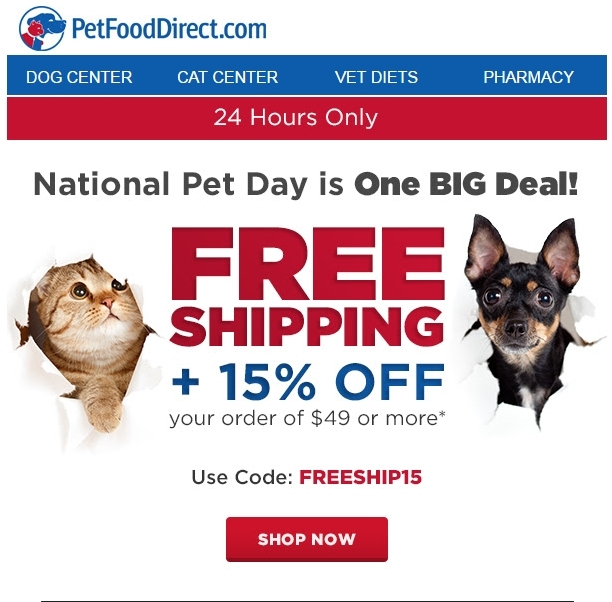 Call us toll-free at 1-877-PET-FOOD. Be sure to mention the following promo code: FREESHIP15 for your savings. Mark Factoran Offer ends at 11:59 pm ET, April 12, 2017. 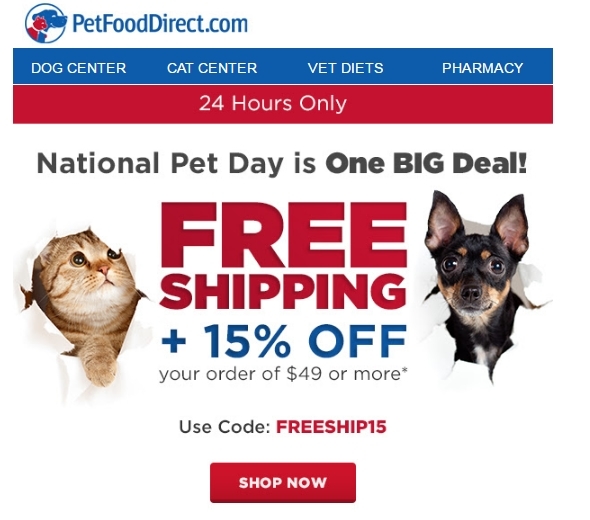 Free Shipping + 15% Off is valid on orders of $49 or more. Enter promo code FREESHIP15 at checkout to redeem. One time use per customer. Ground ship only, and the following products are also excluded from free shipping: frozen & refrigerated products, cat litter, small animal and bird bedding, small animal and bird food, Pestell Paw Thaw Ice Melter, Safe Paw Ice Melt and PlaySAFE Natural Organic Fertilizer. 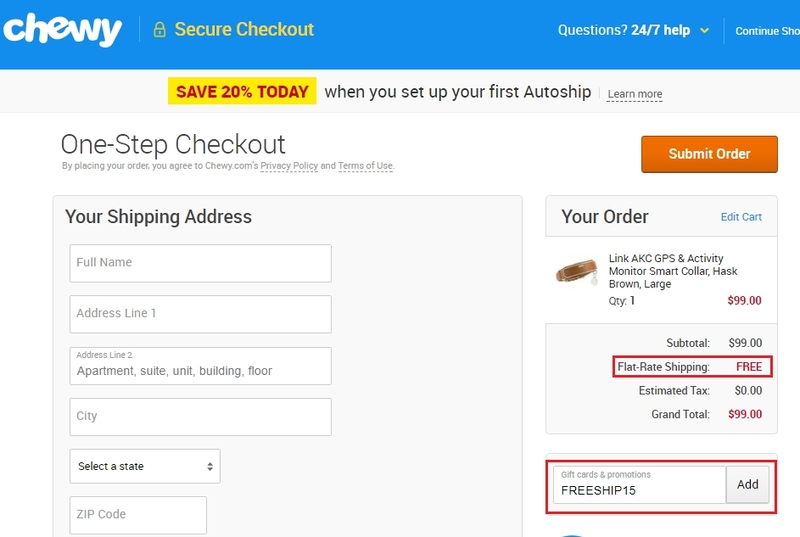 Free shipping cannot be combined with the Auto Ship 15% discount, or with any other promotions, or promo codes. In-stock items only; no rain checks. Not valid outside the continental United States. Not for use in combination with other coupons, or loyalty and reward websites. Luis Romero *Offer ends at 11:59 pm ET, March 7, 2017. 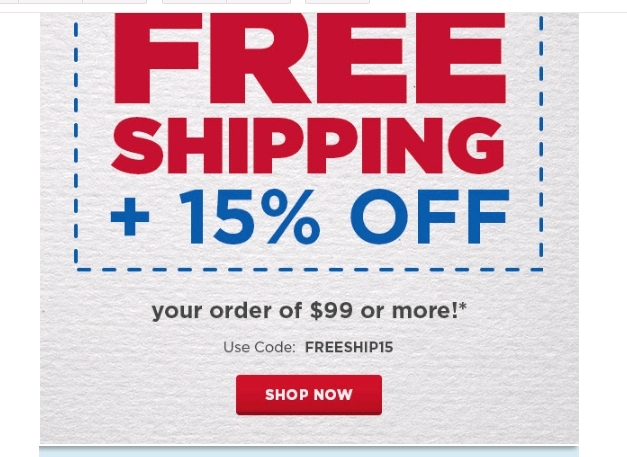 Free Shipping + 15% Off is valid on orders of $99 or more. Enter promo code FREESHIP15 at checkout to redeem. One time use per customer. Ground ship only, and the following products are also excluded from free shipping: frozen & refrigerated products, cat litter, small animal and bird bedding, small animal and bird food, Pestell Paw Thaw Ice Melter, Safe Paw Ice Melt and PlaySAFE Natural Organic Fertilizer. Free shipping cannot be combined with the Auto Ship 15% discount, or with any other promotions, or promo codes. In-stock items only; no rain checks. Not valid outside the continental United States. Not for use in combination with other coupons, or loyalty and reward websites. You can also place your order by telephone! 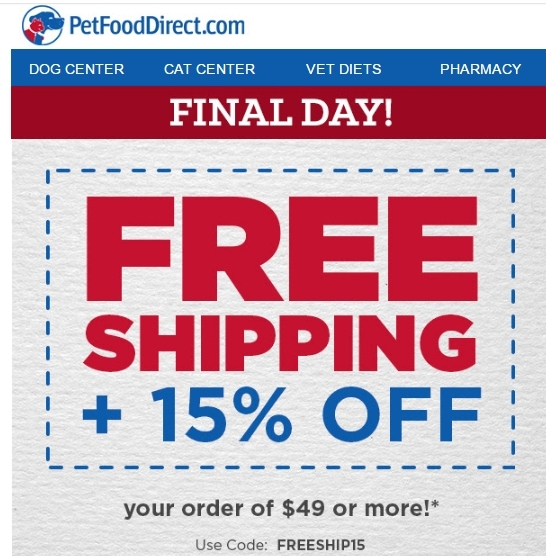 Call us toll-free at 1-877-PET-FOOD. Be sure to mention the following promo code: FREESHIP15 for your savings. William Baldwin *Offer ends at 11:59 pm ET, March 7, 2017. 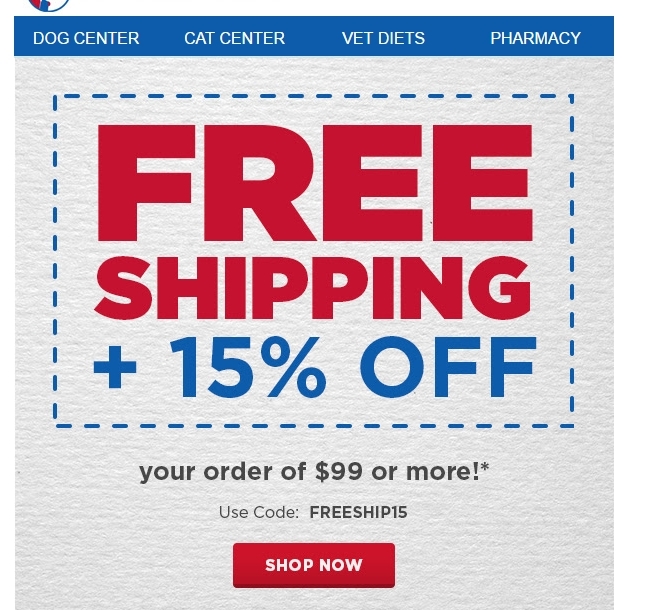 Free Shipping + 15% Off is valid on orders of $99 or more. Enter promo code FREESHIP15 at checkout to redeem. One time use per customer. Ground ship only, and the following products are also excluded from free shipping: frozen & refrigerated products, cat litter, small animal and bird bedding, small animal and bird food, Pestell Paw Thaw Ice Melter, Safe Paw Ice Melt and PlaySAFE Natural Organic Fertilizer. Free shipping cannot be combined with the Auto Ship 15% discount, or with any other promotions, or promo codes. In-stock items only; no rain checks. Not valid outside the continental United States. Not for use in combination with other coupons, or loyalty and reward websites.